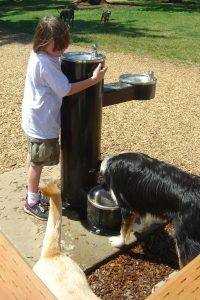 The livability of a community has so much to do with what is available to use and to enjoy. It’s a big part of the reason that I personally moved to Lake Oswego and why I continue to enjoy living here. This is important to me for my own enjoyment and also for the enjoyment of those I love, including my pets. I think it’s rather impressive that a town the size of LO, not a very big town with just shy of 39,000 people, has 4 dog parks. All 4 of them have off leash areas. Pilkington Park (19043 Pilkington Rd) and McNary Park (47 Becket) both have big grassy areas that allow dogs to enjoy off-leash play. These parks are not fenced in. They are open from March 15-September 15 each year. Hazalia Field (17800 Stafford Rd) is the most impressive of the off-leash dog parks. It has two separate fenced in areas, one for normal dogs and one for shy or timid dogs. Seriously, do you know of any other town that has an off-leash dog park for shy dogs? 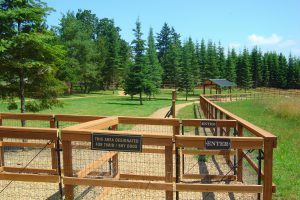 The fenced in areas are impressive with double-gated entries to allow you to enter the park with your dog leashed and then take the leash off before you open the second gate to let them charge out to play. This park is open all year round. 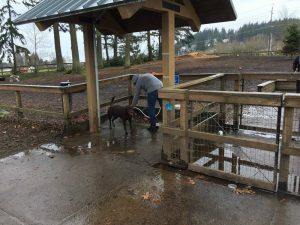 The newest dog park, and what prompted me to want to write this post, just opened about a mile from my house in West Waluga Park (15775 Waluga Dr). Like the park at Hazalia Field it has a big fenced in area with a double-gated entrance. This park is open March 15-September 15. A well-exercised dog is a well-behaved dog. With this beautiful spring weather get out there and let Fido loose. He needs a good romp just like the rest of us.